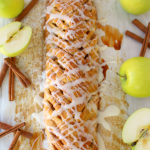 The most amazing breakfast braid recipe! 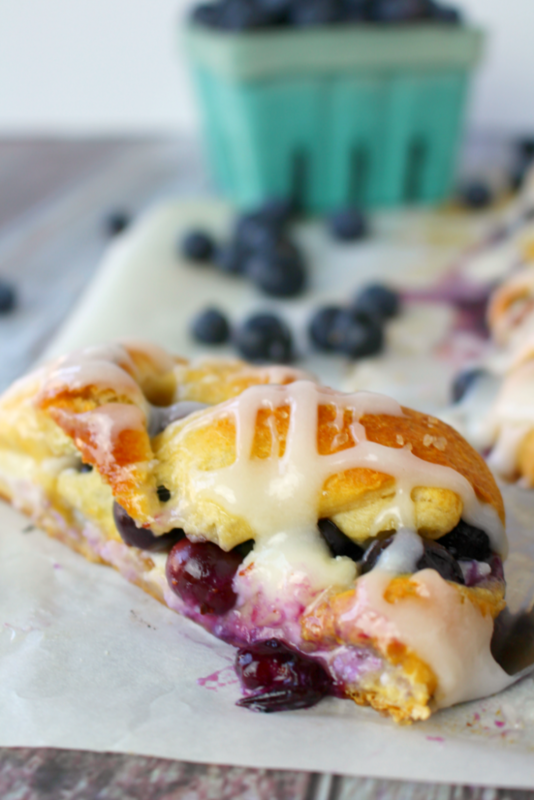 Meet your new favorite breakfast pastry! This super-simple Blueberry Cream Cheese Breakfast Braid is made from simple, store-bought crescent sheets, along with fresh blueberries, almonds and cream cheese. No one will ever know it didn’t come from a fancy bakery! 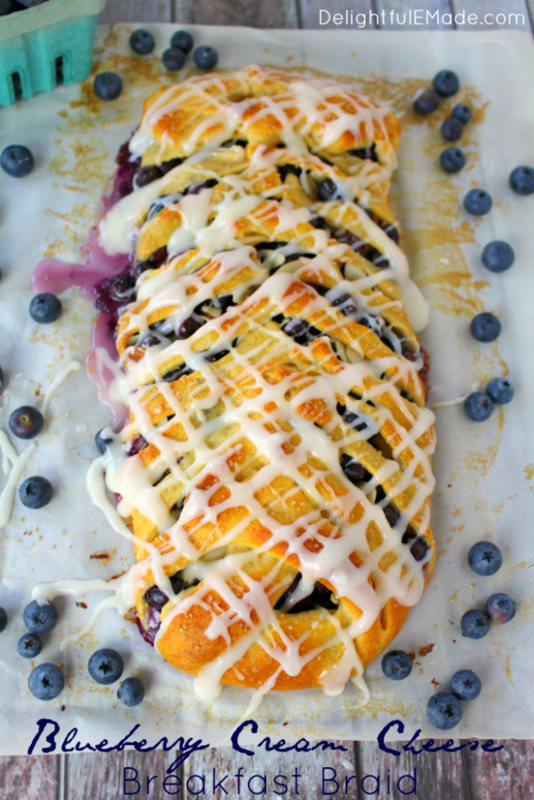 The ultimate weekend breakfast pastry, this simple delicious Blueberry Cream Cheese Breakfast Braid is amazing! With some great shortcuts, like store-bought refrigerated crescent dough, this simple breakfast braid recipe comes together in moments. 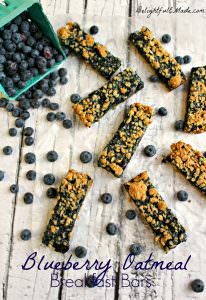 If you’ve even gone through my content here at DelightfulEMade, you’ll quickly discover that I’m pretty much in love with blueberries! We didn’t have them much as a kid, as blueberries were not very plentiful in the rural parts of South Dakota. However, on the rare occasion, where this gorgeous berry would make an appearance, I was gobbling them down like candy. This past weekend, I picked up a BIG container of blueberries, and wanted to make something breakfast-y. 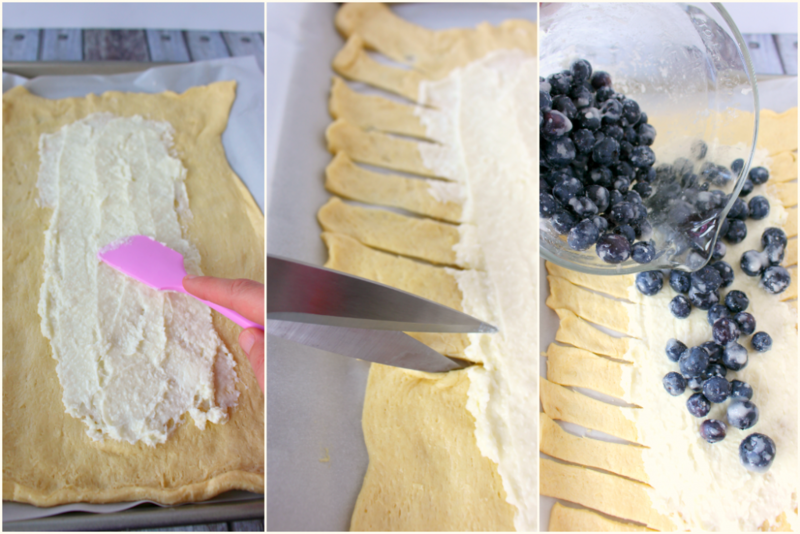 I grabbed a tube of crescent roll dough, and folded together this super-simple, and uber yummy Blueberry Cream Cheese Breakfast Braid! You’ll start by rolling out your crescent roll dough (I purchased the sheet, which doesn’t have perforations. However, if you can only find the crescent rolls, those work just as well.) I then mixed together 4 oz. of cream cheese with a couple tablespoons of sugar, and spread in the center of the dough. 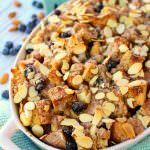 Much like my Blueberry Cream Cheese French Toast Bake, I find that blueberries and cream cheese go really well together. 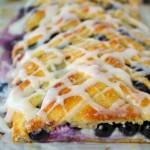 When the blueberries and cream cheese bake, they bubble together making the most delicious filling for this breakfast braid. With kitchen shears I cut strips along the edge of the center (about 4″) – I had around 12 strips. Feel free to also use a sharp pairing knife if shears are not handy. I then rinsed my blueberries, added a bit of sugar and cornstarch, and poured them on to the top of the cream cheese layer. Aren’t those berries gorgeous? Can you spot the star that filled with sugar on the left image? Cool, right?! 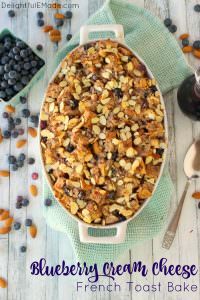 On top of the blueberries I added a sprinkling of sliced almonds. These were a fantastic addition, as it added a nice crunch to the center of the pastry. Then, begin folding the strips to the center of the berries. I simply overlapped each strip on to the next, and folded in the ends – this doesn’t have to be perfect. Just before baking, I added a sprinkling of turbinado or raw sugar to create a pretty, golden crust. This is totally optional, but it actually adds a wonderful texture to the baked dough. If you cannot find turbinado sugar, simple granulated sugar works just as well. It won’t take long for this beautiful breakfast braid to bake. I baked the pastry at 375 degrees for 15-18 minutes. This will give the berries time to bubble and pop, and the crust will become a beautiful golden brown. 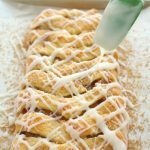 After this gorgeous breakfast braid comes out of the oven, I then drizzled it with a basic powdered sugar/cream cheese glaze. It’s a nice addition to the top of the pastry, and the cream cheese compliments the filling perfectly. Slice while warm, and you’ll have the most glorious morning treat to go with your coffee or tea. Feel free to slice in strips or triangles – whatever suits your fancy. On a bowl, cream together the 4 oz. of cream cheese and 2 Tbsp. of sugar. Spread into the center of the dough, leaving about 4" on each side. Using kitchen shears or a knife, cut diagonal 1"strips along the sides of the dough. Rinse and drain the blueberries. In a bowl, add the remaining 2 Tbsp of sugar, and the cornstarch, and mix together to coat the berries. 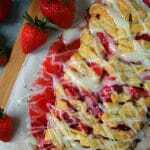 Pour the berry mixture over the center cream cheese area of the dough. Sprinkle the berries with the sliced almonds. 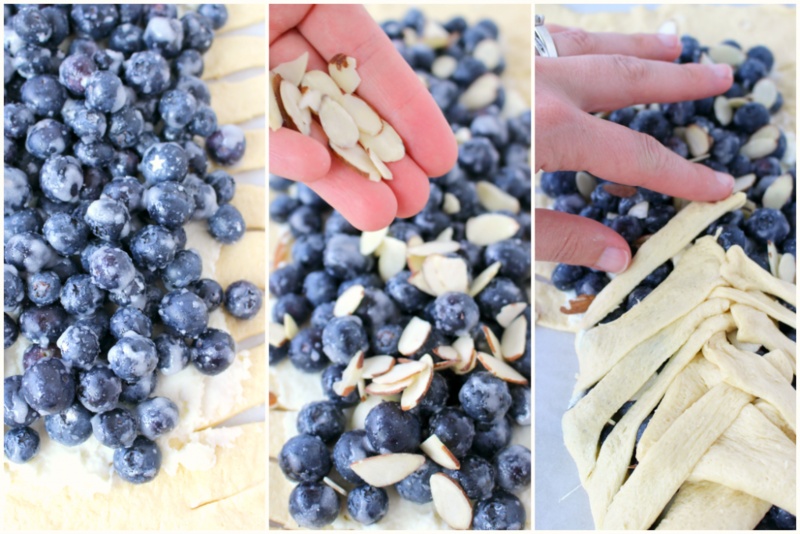 Gently fold over each end of the dough on to the berries, and fold in each strip of the dough, until all the berries and almonds are encased. Sprinkle the top of the dough with the turbinado or raw sugar granules. Bake at 375 for 15-18 minutes. Ahhh...this is absolutley gorgeous! 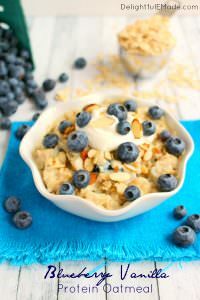 I am crazy about blueberries and buy them in bulk this time of year to put them in everything! ;) I can't wait to make this! Ok - coffee break! Looks delicious!! Thanks for sharing on the What's for Dinner party! Oh my! My mouth is watering just looking at these photos! 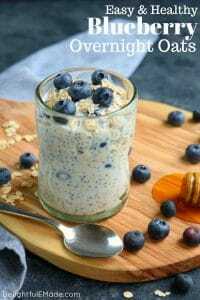 My husband is also a blueberry lover, so I am going to make this for him for Father's Day. I know he'll be tickled blue! Thanks for sharing this on Flamingo Toes linky party! Beautiful recipe! 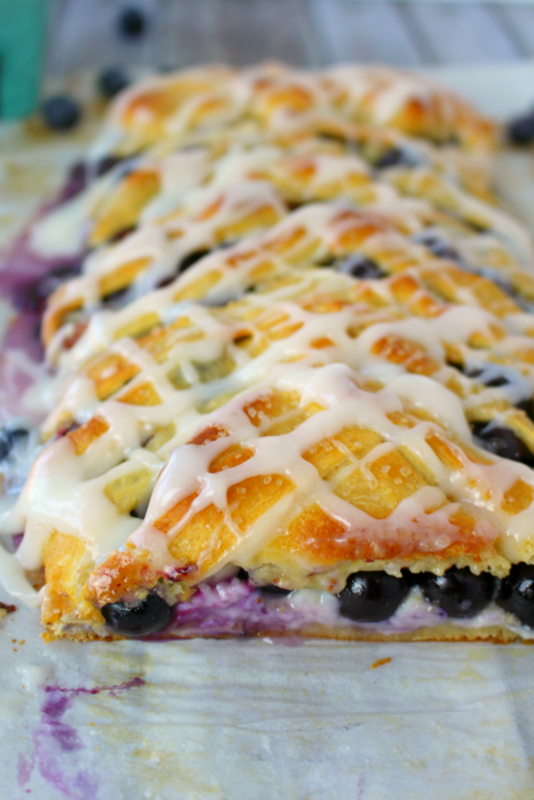 I am a fan of the cream cheese, berry, pastry combo - I need to make this myself! Love this and intend to make asap. What a beautiful breakfast braid. Thanks for sharing with us at Throwback Thursday! Pinned and shared. I HAVE to make this! A couple years ago I bought a frozen braid from a school fundraiser and made it for a breakfast potluck and everyone thought I had made it from scratch, it was delicious. But now I can actually make it myself and I bet it will be even better! I had found other recipes that had way more work than I wanted to go into at the time, this recipe looks easy and perfect. Thanks! 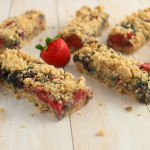 What a yummy treat and easy to make! Didn't have almonds so added a bit of almond extract for a hint of the taste. 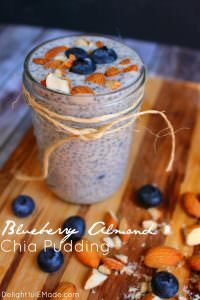 Will make sure I have almonds on hand because I will definitely be making this again. It was a hit. Thanks for sharing. Would the Pillsbury pie crust sheets work as well? It would work, however, it may have a slightly different texture and consistency. 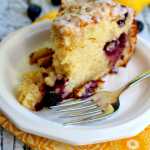 Give it a try - I'm thinking you'll get a gloriously delicious blueberry pie pocket! Yummmmmm!